Being a language enthusiast myself, the language which you might probably think I am most passionate about is Urdu. Wrong. I’ll tell you what. It’s the language that I don’t put any effort at. So recently, when I was reading some articles about which language should you learn? How to teach yourself French? 5 must-have books for a Arabic learner and so on, a sudden realization hit me. There are little to no articles about Urdu books. Probably because foreigners think Urdu is a language that’s not worth their time. Who’s fault is that? I think we all know the answer. I mean think about it. If we ourselves aren’t willing to give time to our language, why would an outsider bother to do that? We live in an era where knowing Urdu is basically being ‘paindu’ whereas knowing an Englishman’s language is being modern. Like what? How about I tell you why instead of thinking that way we should put an effort into our language. Have you ever heard an elder talk in typical Urdu? “Aap husno-khubsurti ka munh bolta saboot hain.” See. Perfectly rolls off your tongue. Who wouldn’t want to say this? Iqbal, Ghalib, Ahmed Faraz, Faiz Ahmed Faiz, Parveen Shakir, Wasi Shah and the list goes on. You might know the names but could you quote any one of them? Or even the names of their ghazals, nazams, naghmas, rubaes, marsias. I bet you don’t even know what a rubae and marsia is. Just like me. Yep guilty. “Hum nay mana keh taghaful na karo gay lekin Khaak ho jaen gay tum ko khabar honay tak” -Ghalib. Flawless. That’s if you understand it. Ever happened that your family is watching TV together, and your dad suddenly laughs out loud while you sit there blank unable to understand whatever they said on Mazak Raat or Gharnaak. Well, you could avoid that by polishing your Urdu. So next time, be ready to laugh louder than your dad. A lot of Pakistani dramas are based on novels. Popular ones being Afshaan, Uroosa, Humsafar, Meri Zaat zarra-e-benishan, Maan mayal. So in order to fully get involved with your favorite drama better, you better read its novel. Just like what our poets are good at; that is poetry, our writers, are equally expert in their field. Umera Ahmed, Rukh Chaudary and Farukh Ishtiaq are writers you must check out. All these developed countries have not relied on other languages other than their own native tongue to be their medium of instruction. The Chinese have always used their own language to communicate in any way. Be it writing scientific articles, giving royal speeches or putting up notices. Same is the case with other nations. France. Germany. Britain. Italy. Spain. USA. Korea. I don’t mean completely. But it’s been 69 years since we have gotten independence from Britain- that’s a long time. English has been engraved too much in our system. It’s time we change. Indeed, Urdu is a language that has elegance unlike other languages. I mean, look at the way it addresses different groups of people and its vocabulary. In English you have ‘you’ to address other people. But in Urdu, you have three ways. Aap- You(formal) Used when speaking to people elder than you or meeting someone for the first time. Tum- You(informal) Used when speaking to your friends or age fellows. Tu- You(very informal) Used mainly by boys when addressing each other. And then you have tons of ways of saying aunt in urdu. Chachi, tayi, khala, phuphi. Not everyone knows English in Pakistan. Especially people in villages and backward areas. Urdu is our lingua franca bringing together all those diverse communities in Pakistan together: Sindhis, Balochies, Punjabies and Pathans. Quaid-e-Azam, who fought to give us a country, chose Urdu as our national language. Period. I’ll end with a quote. ‘Is parcham key sayay talay hum ek hai, hum ek hai’ Just as our great leaders motto was Unity, Faith and discipline, we should try to fulfill this motto in every way and that includes the way we communicate with each other by using our national language. That’s it folks. 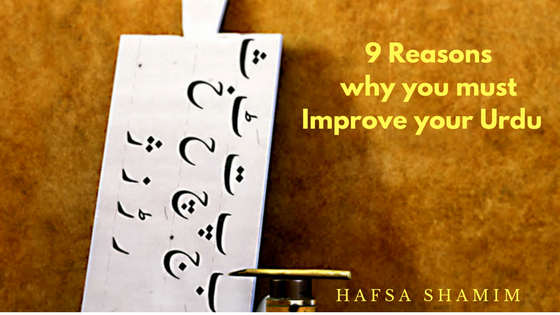 Hopefully this will motivate you to refine your Urdu even further. I myself am on a journey to upgrade my Urdu and plan to aspire many people to join me. Comment below so I can read your thoughts and I’ll try to reply soon. 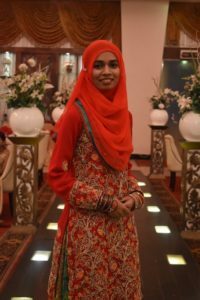 Hafsa Shamim, a student of Beaconhouse, who is currently studying sciences and maths in A level programme, likes to travel, learn different languages, read, teach, play sports and watch movies.